I realized I’ve been getting quite a few hits on my other Backpacking post so I decided to do a follow up considering it’s the time when people are preparing for a new school year. This list is a little more inexpensive but there is a product over $100 in it. Let’s get into it yeah? All photos are from the website, click on the picture to go directly to the website if you want to purchase it. I went into Claire’s to purchase some hair accessories and saw some cute bags so this was the first website I went to. Obviously I had to throw striped bags into the mix. On the first bag, I love the mixed stripes and the faux leather detailing. But most of all it’s blue and white. I love a blue and white stripe and the light brown trimmings just finish it off perfectly. On the second bag, the crochet…. ohhh the crochet! So cute! I love that they didn’t go crazy with outer pockets and just left the bag simple. It may not be the most ideal bag for back to school as it doesn’t have all the extra outer pockets but it’s still cute nonetheless. On the last bag, if you’re looking for a more neutral bag then I think this is it. The different sized stripes and multiple pockets give it a little edge. The best thing about canvas bags is that they can be throw in the wash when they start to look a little dirty. The backpack by Poverty Flats is a versatile one. The straps can be worn as a normal backpack, a single strap or removed and carried as a top handle. Perfect if you’re looking for simple, sophisticated bag for school or work and school if you’re doing both. 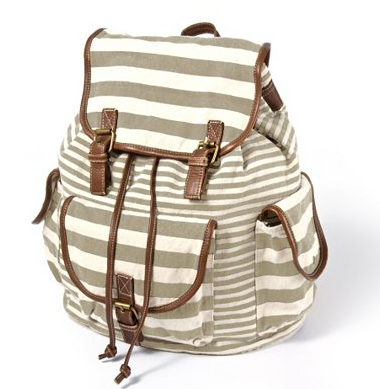 Or if you commute to work and would like a nice feminine backpack. The Marc by Marc Jacobs bag has a retro feel to it and I chose to show you the purple because I like purple. :). But seriously, I like the retro vibe, tiny star print and the simplicity of the bag. It takes me back to the 90s :). I don’t remember why I decided to check Anthropologie but I’m very happy I did. I love the abstract print on this backpack. This bag is truly a “piece of wearable art” as said in it’s description on the website. If art is your thing, then this bag is for you. If you’re wondering why I chose to only do backpacks, it’s because it’s the wisest choice. I thought Messenger bags we cool growing up but the load you have to carry makes it an unwise choice. Backpacks are the best for back and shoulder support, so I won’t recommend any other type of bag. If you are like me and fashion takes over being comfortable then I can also work on that post – just leave a message in the comments section.